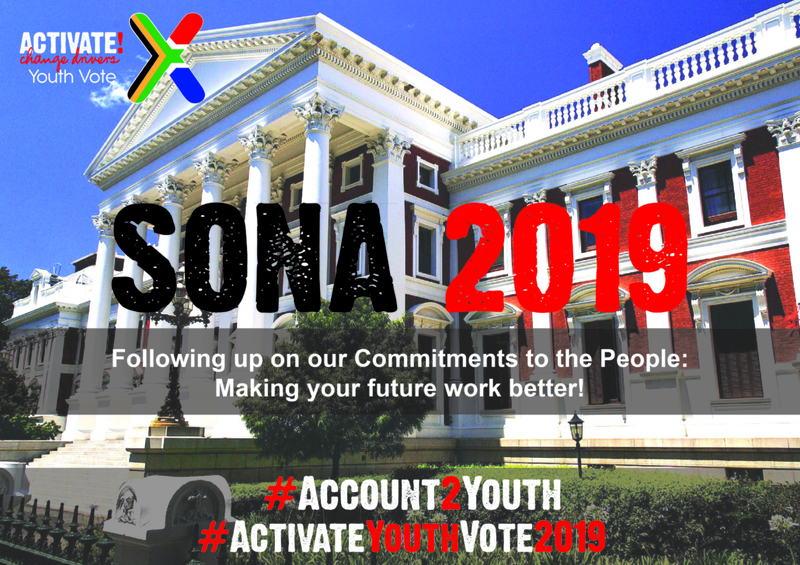 SONA: South Africa’s unemployable youth a lost generation in the making - Activate! The State of the Nation Address (SONA) is one of the most important highlights on the South African socio-political calendar. The SONA partly derives its importance from a historical point of view, because it was during the SONA of the 2nd February 1990 that the then state President F.W. De Klerk announced the release of Nelson Mandela. That SONA announcement became a major policy shift and effectively signaled the end of apartheid and set in motion a series of events which propelled South Africa towards a democratic trajectory thereby augmenting its socio-political reality for the next quarter of a century. Although the SONA is a neatly choreographed ceremonial, it is also a display of constitutional democracy in action with the primary role being to inform South Africans on the government’s programme of action for the year. It is also an important barometer through which citizens (particularly the youth) can measure and follow up on commitments made by the government and hold the government to account should those commitments fail to materialise. One such commitment has been the government’s promise to reduce and eradicate youth unemployment; this commitment has been consistent in all the past three SONA’s but official statistics continue to reveal that the problem continues unabated. A critical question must, therefore, be asked; does the government of South Africa have the requisite political will to end youth unemployment? In 2016 President Jacob Zuma, while delivering a SONA themed “Following on our commitments to the people”, argued that the European Union through its more than 2 000 companies in South Africa had created 350 000 jobs and in 2017 argued that government’s extended public works programme (EPWP) had created 2 million work opportunities since 2014 half of those being taken up by the youth. President Zuma further predicted that by March 2019 nearly 6 million work opportunities would be created by the EPWP programme. In 2018 President Cyril Ramaphosa delivered a SONA themed “Making your future work better” and announced that government through its public employment programmes had created 3 million work opportunities and would in the next three years create 1 million internships in the education sector; furthermore he stated that government would initiate a Presidential Jobs Summit in October 2018 which would discuss job retention and job creation blockages in order to stimulate greater participation in the economy. Looking at these interventions at face value one might argue that government is indeed working tirelessly to ensure the demon of youth unemployment is exorcised in South Africa. Unfortunately, numbers from Statistics South Africa paint a grim and depressing picture of a youth stuck in a vicious cycle of poverty and unemployment. As of July 2018 Stats SA estimated that unemployment stood at 27% in the country, the agency further argued that out of South Africa’s 57 million people about 37,7 million were of working age (15-64 years) but only 22,4 million made up the labour force out of which only 16,4 million were employed. This means over 6 million people are unemployed and 2,8 million have given up on looking for employment altogether. The country’s statistician-general further went on to say that the burden of unemployment was concentrated amongst the youth with over 63% of unemployed persons being young people; this, in summary, means that 30% of South Africa’s youth have jobs and about 50% of the youth participate in the labour market. A deeply concerning category emerged out of the Stats SA youth unemployment numbers, Stats SA identified and termed this group “NEET” (Not in Employment, Education or Training) a group aged between 15-24 years numbering 3.3 million young people who had completely disengaged with the labour market and were not even enhancing any of their skills. The numbers of this group from 2017 until 2018 remained unchanged meaning all of the government’s intervention failed to reach them. The fact that they are not in any form of training decimates any prospects of future employment making them literally unemployable and virtually unable to access even a basic internship from the government. If 3 million young people are not employed nor in any form of training where are they and what are their future prospects? Is the government’s immobilism and our lack to hold it accountable complicit in the creation of a lost generation? What is different with 2019 is that it is an election year and during an election year two SONAs are delivered and if young people are not happy with the status quo they have the ability through the power of their votes to change it and make sure the next SONA is reflective of the future they espouse. Accountability begins when the youth stop celebrating procedural democracy purely for its own sake but by demanding a more substantive democracy. The failure to hold the government accountable on youth unemployment means we are guilty of being complicit in the creation of a lost generation and allowing social exclusion where others are left on the periphery of economic participation.